Hi, my name is Kelly and I’m a TV show-aholic. With pretty much every new TV show that gets hyped up enough, you will find me devouring it episode after episode. That’s what happened with Stranger Things. I found myself on a binge-watching fest that had me finish the show in two days. That’s what happens when a show lives up to the hype and is filled with enough horror and suspense to keep you at the edge of your seat constantly. It’s also set in the 80’s and I love anything old school, so when a show is said to be reminiscent of an 80’s horror movie and everything from the clothes, to the music, to the big and small props are pretty authentic to the decade, it makes me love it even more. 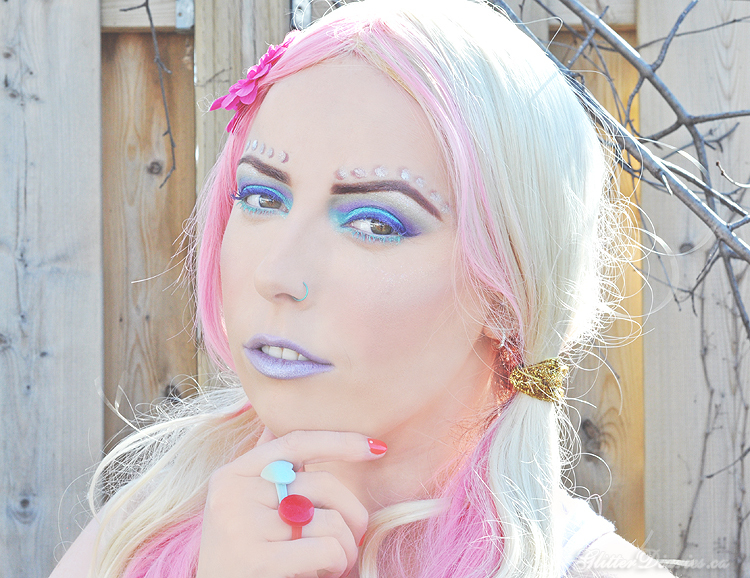 Since Halloween has come and gone, I knew I wanted to share this makeup tutorial anyways. Eleven is definitely a stand out character on Stranger Things and one of my favourites. Her look is pretty simple so I decided to amp mine up a little bit. Dark circles under the eyes, dirt around the face and a bloody nose are pretty much the key points in recreating this look. Eggo waffles are optional but a definite plus. 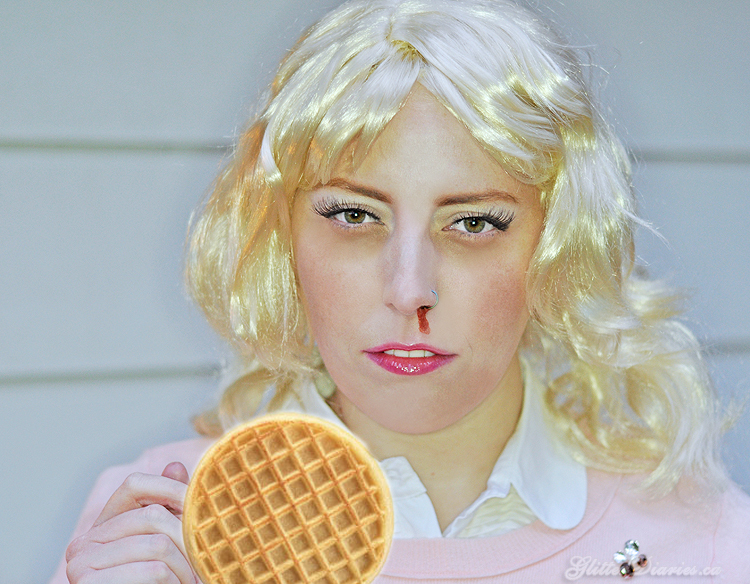 Sadly, there were no Eggo’s on hand at the time of this photo shoot, so Photoshop came in and saved the day! 1. Apply a white base to your lids and blend upwards. 2. Add a light brown to your lids and blend up. 3. Apply some fluttery lashes and apply brown mascara to your lashes. 4. Line your upper waterline with black liner. 5. Apply your foundation, concealer and then create some dark circles with a brown cream and taupe shadow. 6. Then add some brown (dirt) splotches to your face with a stippling brush. 7. Add some peachy pink blush to the apples of your cheeks. 8. Apply a light pink gloss to your lips. 9. 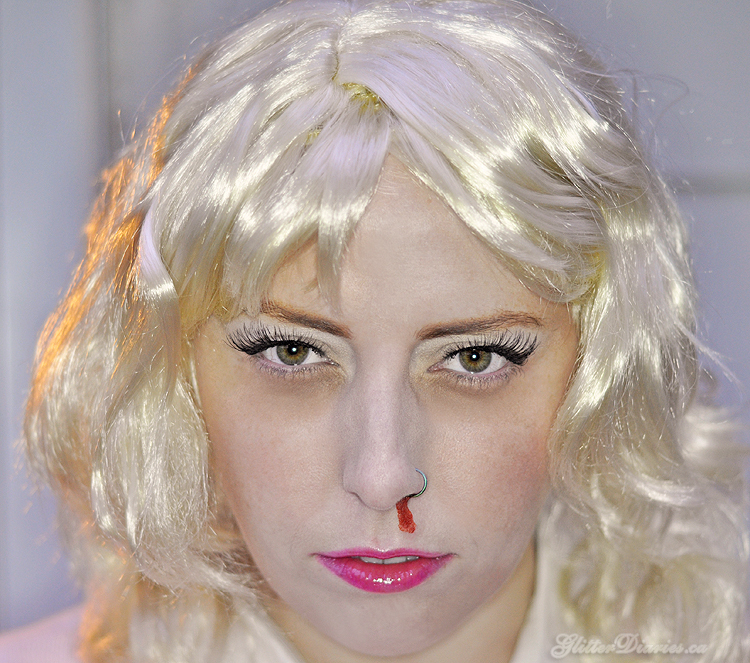 Put on a blonde wig and add some blood to your left nostril. What do you think of my Stranger Things “Eleven” Makeup Tutorial? Who is your favourite character on Stranger Things?! Share your thoughts below!